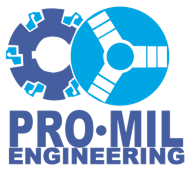 Pro-Mil Engineering Ltd was founded in 1982 by George Wilkins. It is part of the West Midlands-based Kingsbury Jig and Tool Group, also founded by George Wilkins. It was and still is, a family-owned business, specialising in CNC precision milling of one-off, prototype and very low volume large engineering and industrial components up to 50 tonnes. Ever vigilant with regard to costs, quality and lead times, Pro-Mil has gained several Industry Approvals and works for many UK and European organisations, covering a broad range of engineering applications, including Aerospace, Marine, Power Generation, Nuclear, Rail and Satellite Communications. Until 2014, Mike Hedley was Managing Director, when Ian Hinton, who had been General Manager since 2007, took over. Mike Hedley still retains an active overview of the business, which has a staff of nineteen and a turnover of around £2m per annum. Having originally worked with a paper-based system, Pro-mil installed Scorpion in 1996. This worked well for a time, until they realised they needed something faster and more efficient, so Mike looked around for other options. It was in 2006, when he visited the Mach 2006 Exhibition at the NEC, that he found the Tricorn stand and was sold on their system, which he could see was absolutely right for their needs. The system was installed in 2007, in conjunction with Datafusion and this initially worked in tandem with their existing system. Ian said, "It all went smoothly. The system was easy to learn and Tricorn is excellent with the back-up and help when we need it". Ian concluded, "Ian said ‘It is great. The system is simple to use, we are able to trace data quickly and efficiently and it has just made life easier". Pro-Mil Engineering Ltd was founded in 1982 by George Wilkins. Specializing in low volume, large components up to 50 tonnes, Pro-mil currently has a staff of nineteen with a turnover of c.£2m.